In a couple of months, I'll be touring schools and libraries in Ontario, talking about some of the marvellous and strange animals in my book, Lizards in the Sky: Animals Where You Least Expect Them. So I've been thinking about critters and presentations and cool pictures and things like that... and, well, one thing led to another, and I found a whole raft of new, cool, and utterly weird critters in one of my favourite habitats, the deep ocean. 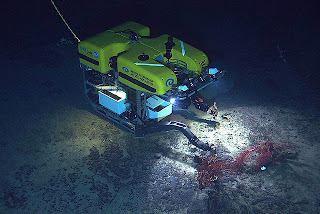 The ROV Hercules operates deep in the Atlantic Ocean. We're talking deep, here--really deep. So deep and so strange that exploring the deep ocean is like exploring an alien planet. In fact, you need the equivalent of a space ship to go to the deep ocean, something that can see in the absolute dark and survive pressures that would crush the toughest submarine. But, oh, the wonders when you get there! How about this? Five full kilometres below the sunny surface of the Caribbean Sea is the Cayman Trough. It's utterly dark and very cold down there, but not everywhere. 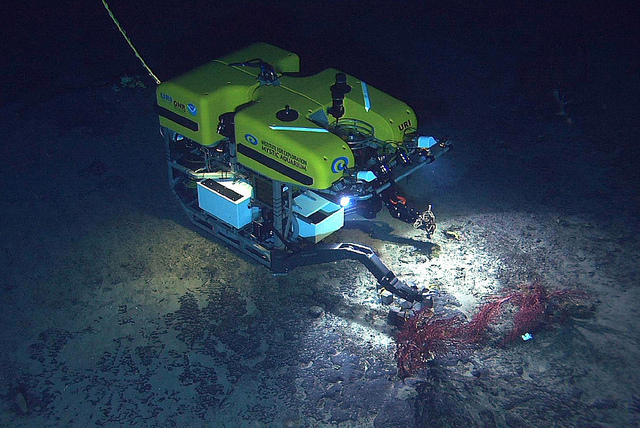 Just last month, scientists released video taken by a remotely operated undersea vehicle. It shows mineral chimneys at tall as four-storey buildings, belching smoky black water as hot as 400 degrees Celsius, four times the boiling point of water. Even more astounding were the creatures lurking around those vents: fireworms that look like woolly caterpillars and delicate, almost-colourless shrimp with special organs for detecting hot water. volcano in the Pacific Ocean near New Zealand. 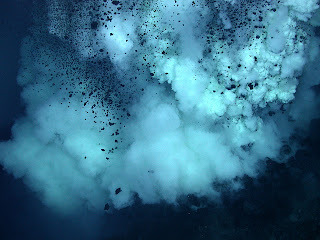 Photo credit: Submarine ROF 2006, NOAA Vents Program. Over in the Pacific Ocean, there's an even deeper spot--Challenger Deep in the Mariana Trench, on the west side of the Pacific. At about 12.5 kilometres, it's the deepest spot in all Earth's oceans. And even there, where the pressure is 1000 times the pressure we experience at Earth's surface--even there, you'll find life. A lot of it! Tiny life, to be sure--bacteria. But they swarm there far more densely than in the shallower water at the edge of the Trench. You don't even have to go super-deep to find the super-weird. Over the last couple of years, scientists have been finding some spectacularly strange creatures in the ocean surrounding Antarctica. National Geographic compiled a list of the five weirdest Antarctic species, including a transparent fish and sea spiders that breathe through holes in their bodies. 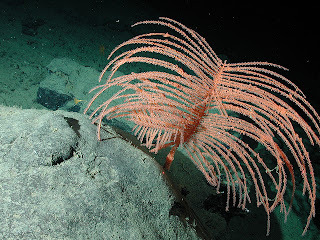 below the ocean surface at Davidson Seamount, California. Photo credit: NOAA/Monterey Bay Aquarium Research Institute. Not to be outdone, the biologist who writes one of my favourite science blogs, The Echinoblog, compiled a list of the ten weirdest Antarctic invertebrates. His list includes a 30-centimetre worm with serious teeth! Me, I'm waiting eagerly for the next list--maybe longer and even weirder. In the meantime, I guess I had better get back to what started all this, preparing some presentations about my own favourite weird beasties. Seeya! We all do it every day. But who did it first? And when? 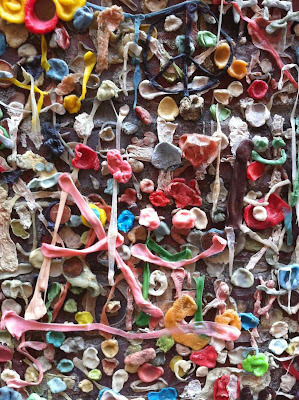 People worldwide have chewed gum for hundreds of years. Resin from certain types of trees, various sweet grasses, leaves, grains and waxes have evolved over many years into the flavored gums we know today. The ancient Greeks chewed mastic gum for centuries. Formed from the resin found in the bark of the mastic tree in Greece and Turkey, Grecian women chewed it to clean their teeth and sweeten their breath. The Indians of New England taught American colonists to quench their thirst by chewing the gum-like resin bleeding from spruce trees. In the early 1800s spruce gum blobs were sold in the eastern United States, making it America's first commercial chewing gum. Sweetened paraffin wax became an acceptable alternative around 1850 and eventually surpassed spruce gum in popularity. Modern gum products evolved from a chicle-based gum brought to the United States in the early 1860s. Chicle is derived from the milky juice (latex) of the sapodilla tree that grows in tropical rain forests of Central America. This tree is found mainly in Mexico, Guatemala and Belize. Everyone liked chewing the gum so demand for chicle rose quickly. But, as suppliers soon realized, their supply was limited by the trees from which it was derived. The trees needed an average of four to eight years of rest between tappings. That’s when manufacturers turned to synthetic gum bases to continue their business. Paraffin, originally discovered in 1830, was an option as it is colorless, odorless, tasteless and plentiful, but others kept searching for a better material. An important fact to remember, as you are chomping away, is that chewing gum is not biodegradable! As we just saw, the gum base we chew can be separated into different, but relatively similar categories. Essentially, it is either made up of plastic, rubber, or wax. 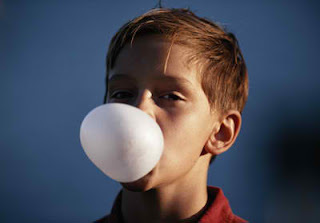 Subsequently, chewing gum will not simply dissolve or disappear after a few weeks, or even years! Because of this, it is important not to throw your gum on the ground outside. Wait until you see a trash can, or swallow it so it can pass through you, undigested, and be disposed of that way. Given that, among many others around the world, Americans alone chew, on average, 160 -180 pieces or about 1.8 lbs of gum per person, per year, the resulting waste is estimated to add up to more than 250,000 tons annually! 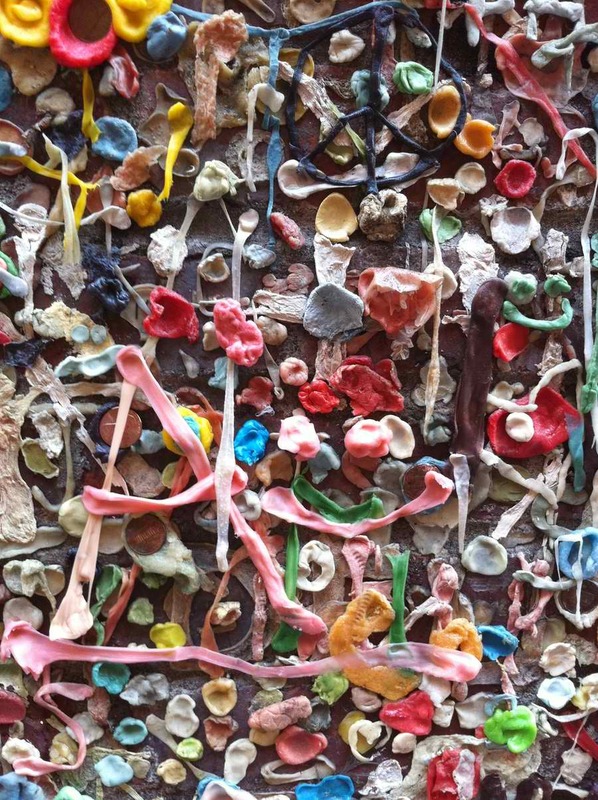 Just think of all those blobs of gum we all see on sidewalks everywhere, every day. Perhaps we should all consider what Singapore has done. Chewing gum is banned in Singapore under the "Regulation of Imports and Exports (Chewing Gum) Regulations." Except for chewing gum of therapeutic value, the "importing" of chewing gum into Singapore is banned. Gum can be bought from a doctor, but must be prescribed. The ban on chewing gum in Singapore can be considered an extension of the littering law. Therefore, the act of chewing gum in Singapore is associated with similar penalties to those imposed for littering. The littering law requires a fine of $500 to $1,000 US Dollars (USD) for first time offenders. Repeat offenders may be fined up to $2,000 USD and assigned a Corrective Work Order (CWO). Beats getting buried under tons of gum! The shrinking sea ice of the Arctic Ocean has been in the news a lot lately, along with photos of polar bears stranded on ice pans or wandering hungrily along bare shores. But what does the disappearing ice affect, apart from polar bears and some shipping companies that see a shorter sea route opening up? Arctic sea ice supports a huge and complex ecosystem that ranges from polar bears, birds, and humans down to organisms too small to see without a microscope. Here are a few sites about that world - and a lot of gorgeous photographs! The Census of Marine Life's Arctic Ocean Diversity website has great information and amazing images. Click on Species to see some of the creatures that make use of the Arctic Ocean and its ice, from top to the ocean bottom. 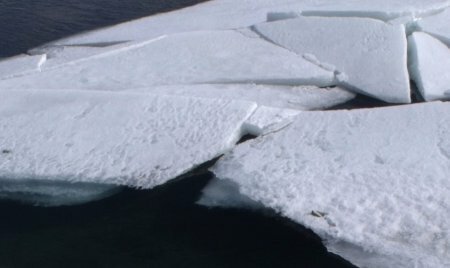 The US National Earth Science Teachers Association’s page on Arctic Marine Life gives a quick overview of Arctic Ocean biology, from algae to polar bears. A young Russian scientist and photographer, Alexander Semenov, has been photographing Arctic sea life and sharing his photos with the world. There’s an article about him (with lots of lovely photos) and here's his own website and gallery. How about the people who live with the ice all their lives? What can they tell us about it? The Inuit of northeastern Canada have been collecting traditional information about sea ice and sharing it at Inuit siku (sea ice) Atlas. What does it really look like up there, around the Arctic Ocean, both above and below the ice? The photo galleries of Canada’s ArcticNet research program can give you a good idea. And if you’re a student or a teacher and you want to see the Arctic for yourself, it just might be possible. Check out ArcticNet’s Schools on Board program. There's good news hot out of the University of Victoria (where I'm currently studying), and their good news is making the rounds on the Internet. A young "citizen scientist" found a great way to exercise his interest in biology when he learned about the Neptune program. This is a program from the University of Victoria, which has placed several underwater ocean observatories on the sea bottom near Vancouver Island. Neptune is gathering so much data, including hours of video, that the call has gone out for interested people to watch their sea-bottom videos and report anything interesting. A young man in Ukraine, named Kirill Dudko, has been watching Neptune's videos. When he sees something interesting, he posts the clip on his YouTube channel. On January 12, 2013, he spotted a hagfish on the sea bottom as it was snatched up by a large marine mammal. He posted the video clip, and notified Neptune. They were glad to report that Kirill is the first person ever to spot a northern elephant seal feeding on the sea bottom at 894 metres! Here's the news that Neptune posted about Kirill Dudko -- check out their website here. 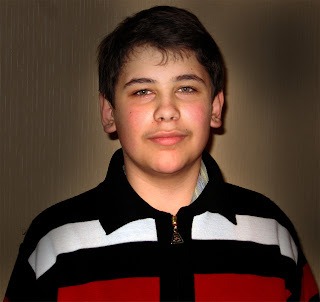 It's a well-written article with a nice photo of Kirill that I've copied above. They've also edited the clip of video that Kirill posted into a short, two-minute video that explains about Neptune and what this sighting means. Neptune's article goes on to explain how people can become part of the citizen science team that can look at the live video streams. Check it out! This can be a good activity for family members using a computer together, or for students to do for extra credit at school, but mostly it's interesting and fun.